Let us take you with us to Solaris, planet of mystery, embodiment of man's latent conflict with the unknown. Man, face to face with his conscience, and with his past. Kris Kelvin: Suffering makes life seem dismal and suspicious. But I wont accept that, no I wont accept that. Is that which is indispensable to life also harmful to it? No, It's not harmful. Of course it's not harmful. Q: In which city was the busy traffic scene shot? Q: Who composed the main theme of this film, and what is the name of the piece? Q: Why is Snaut bandaging his hand? The thing that generally stands out most about this movie is that it is long. Very long. And Russian. Very Russian. It raises a lot of interesting questions about the nature of humanity, conscience, love, etc. which, honestly, I'd never thought to ask before, and don't care enough to answer now that they HAVE been asked. (Will Shame really save humanity? Who knows? Maybe. How will it do that? Haven't a clue. Now what's for lunch?) That's not to say I didn't like the movie. I did. It's very beautifully shot, such that I think it would be worth purchasing, even if I never sit through the whole thing again, just so that I can have scenes like "City of the Future" on hand as a reference for my own film-making endeavors. Speaking of which: "City of the Future" is a very long scene consisting entirely of one character driving through the streets of Japan. It's supposed to look like, well, a city of the future, but to modern American audiences, it won't very much. It just looks like a guy driving his car through a series of tunnels, and past a series of skyscrapers, as day turns gradually into night. It goes on for five minutes. But here's the thing, the paradox of this film: It didn't bother me that there is a five minute sequence consisting of nothing but shots of traffic. In fact, I loved it. It's an amazing scene, really quite beautiful in its own way. And a lot of the film is like that. It's slow and confusing, but still, it's never boring. Even once Kelvin gets aboard the Space Station, wherein 90% of the decor looks exactly the same. It's still fascinating to look at. And the weird thing is, I can't figure out why. I mean, when I tried to watch 2001, another very long, beautifully shot movie set largely in space... I was bored literally to tears in the first 10 minutes, and had to shut it off. (No offense to fans of the film; I realize how incredibly crass I am for failing to recognize the genius of 2001. It's something I will just have to come to terms with on my own.) 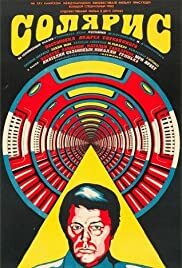 But for some reason, while watching Solaris, even when absolutely nothing was happening, I could not tear my eyes away. I have the strangest feeling that, if I were indeed to watch the movie again--without the subtitles--it could become one of my all-time favorites. I don't know if I can recommend this film to others or not, because I have no idea if anyone else will share my sentiments. I don't know who will understand it and who won't, or who will even think it's worth trying to understand. There are, of course, some people who absolutely love it, and probably even some who understand it (or think they do), because... well, it's a classic, and a movie doesn't become a classic if nobody likes or understands it. But there are probably just as many people who hate it, because... well, it's a three-hour Russian movie. At any rate, though, I think it's at least worth a look. If you find it boring, slow, incomprehensible, whatever... just turn it off. No big deal. But, on the other hand, if you find yourself inexplicably compelled to keep watching, unwilling or unable to tear yourself away for a single frame... well, then, you're welcome. 252 of 342 people found this review helpful. Was this review helpful to you?